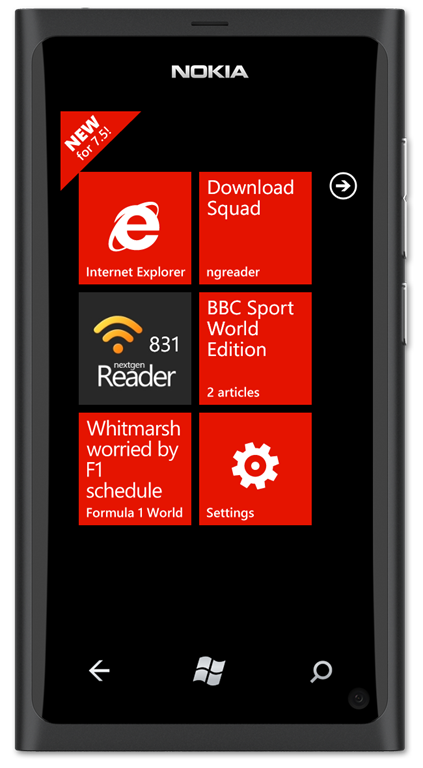 Nextgen Reader | A Google Reader Client for Windows Phone. Come join us over at http://nextmatters.com/! Today, Nextgen Reader gets a bunch of great improvements in its latest update to version 3.1. Let’s take a look. Above is a screenshot of new subscriptions hub with featured section, and gone is “my feeds” section. Yes, we’ve moved all the feed management functionality to main screen itself i.e. you can pin/edit/delete a feed by simply using tap and hold gesture on desired feed. Another most requested and important feature is smarter article view. Many a times, you’ll find something interesting to read by following links in an article. Now if that happens, you can simply tap on view button to mobilize it for reading. In fact, all of the actions – share/save/email now act upon the current opened link in your reading view. So, without further ado, below is the complete change-log for latest update. We hope you enjoy it. New: Smarter article view i.e. share/save/email/mobilize current opened link instead of original article. 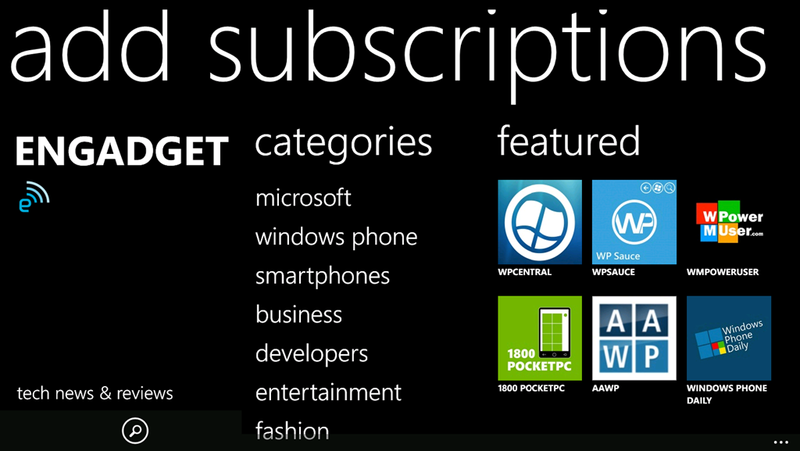 New: Dynamic subscriptions hub with featured section to find latest and popular feeds. New: Tap and hold to edit/pin/delete a subscription from main page. New: Pin to start (live tile) experience. Improved sharing on Facebook with embedded links. Default: Always use HTTPS for sync. Fixed: Always sort starred items by newest first. Several bug fixes and enhancements. In addition to above changes, Instapaper and Pocket (Read It Later) accounts are now available only in paid version. Thanks everyone for the great feedback. Please keep the ideas and suggestions coming. Now that we’ve got the 3.1 release out, we’re rolling up our sleeves and getting closer to the biggest task: letting you have nextgen reader right on your Windows 8 PC/Tablet. Stay tuned. Please check your marketplace for latest update or download from here. One of the most requested features for Nextgen Reader has been filtering. While we continue to look forward to a perfect solution (Google! Can you implement one? ), there already exists a very nice solution. 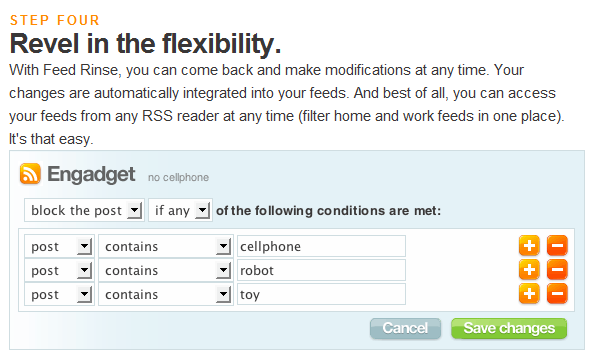 If you’ve got unruly RSS feeds, we’ve got your back. 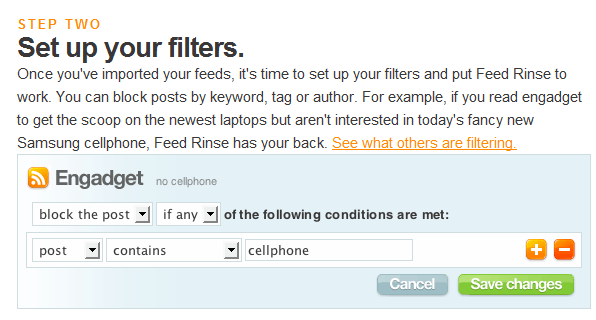 Feed Rinse is an easy to use tool that lets you automatically filter out syndicated content that you aren’t interested in. It’s like a spam filter for your RSS subscriptions. When you import filtered feeds into Google Reader for the first time, it may not work immediately. Press “mark all as read” and wait for couple of hours to see the magic happen. The feeds are updated every 2-4 hours which is not really bad for most of us! The problem is that Google Reader polls popular feeds more frequently than less popular ones. Popular feeds are determined by the number of users subscribed to the feed URL. Though RSS feeds are not time critical like Twitter. Even if you’re offline for a few days, Reader will continue to gather posts from the time you left off. Once you are back – you have all the new posts waiting to be read from the time when you left off. Great! Isn’t it? So sign up for the free Feed Rinse account to get more out of your subscriptions. Early next week, Nextgen Reader will get a new update (v2.4) with some nice new features and a heap of bug fixes and improvements. Here’s a look at what’s new. 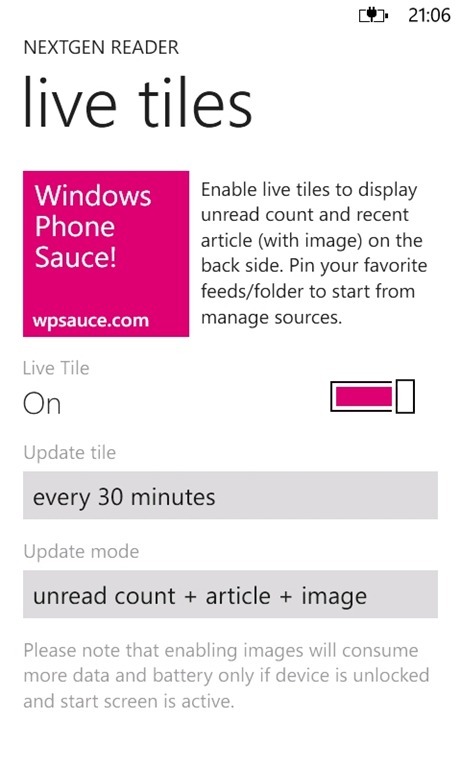 The live tiles now support three different update modes – “unread count”, “unread count + article” and “unread count + articles + images”. Yes, now you can see the beautiful images on back side of pinned tiles (if available). Also, the images are downloaded only if device is unlocked and start screen is active. So if the device remains locked for six hours, no cpu or data is consumed for processing images. Also, the live tiles now display recent article for at least 30 minutes unlike before it used to disappear after opening the app. The new behavior is similar to ME tile, where status updates are displayed for sometime even if you open and read them. 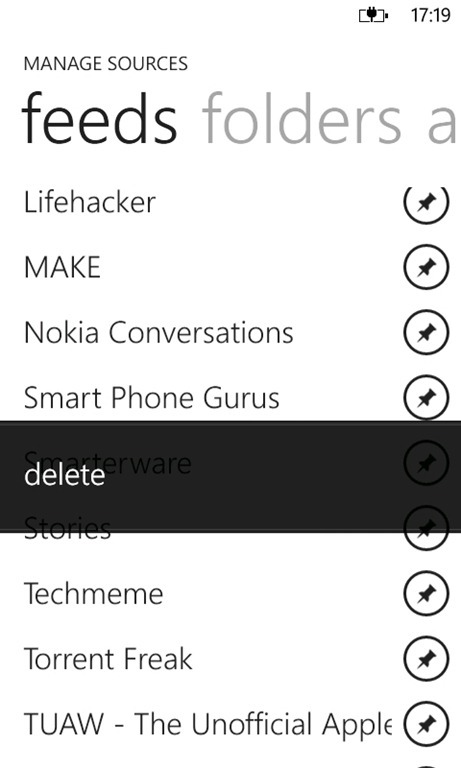 Important Note: After the v2.4 update, you’ve to re-enable the live tiles through app settings. Also check that “Nextgen Reader” is turned on in phone settings –> applications –> background tasks. The v2.4 update introduces the new manage sources hub with complete management of feeds. 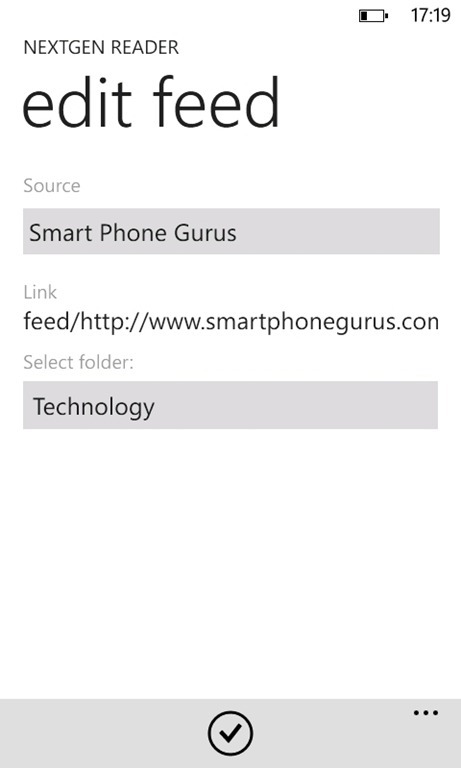 Now you can edit/rename/delete feeds and folder including moving feeds to a new folder. 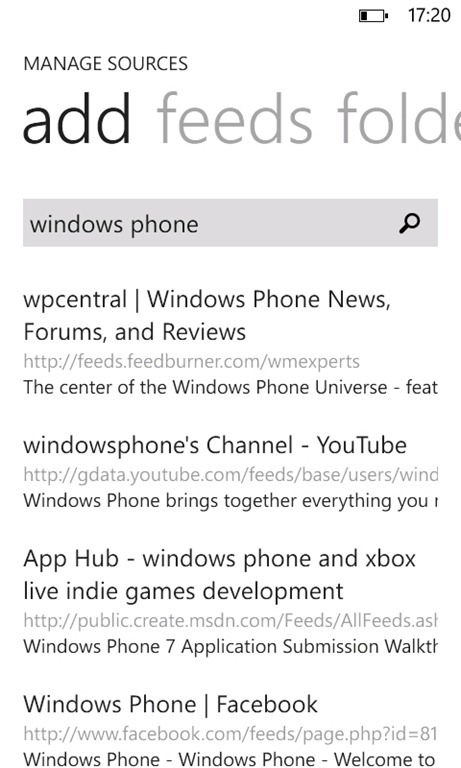 It also improves the search and subscribe feature. 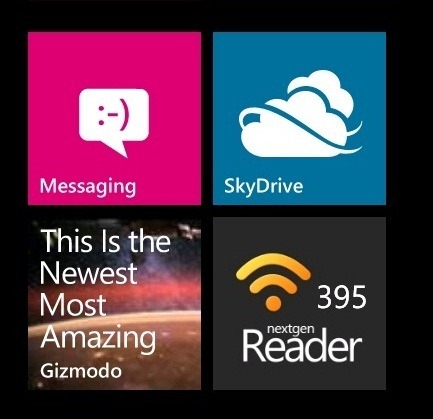 Last but not least, it is super easy to pin multiple tiles to start screen. In addition to above changes, the update also includes the option to change Google Reader password/account. Further, we’ve improved scrolling in article view & mobilized page and made several UI changes (including the updated sharing page). Finally, there is no loop back to first article when swiping in article view (and new animations when you reach the last article). Besides the above improvements, there’re several bug fixes like saving the post title in read it later, handling multiple YouTube videos and using the correct font for Japanese language. Nextgen Reader just completed it’s first year on 22nd January, so watch out for a big surprise when v2.4 update lands in marketplace over the next 2-3 days. And make sure, you’re already following us on Twitter or Facebook. As always, we’re working hard to bring even more goodness to Nextgen Reader, so please continue to send us more feedback and feature requests. Thank you! Wow… 2011 is coming to an end and as you may already know NextGen Reader got a version bump last week. I hope you liked the new features and improvements in v2.3, most importantly swiping to navigate between articles and image caching. It may possibly be the last update of the year, but there is still more than a month for first anniversary of @ngreader (22nd January). Do not forget to check out v2.3 video at the end. First, I do not prefer automatic translation using the online tools. Secondly a lot of content is planned for next few months and localizing now would mean that we have to localize again and every time for next few updates. This will increase the release cycle period and also double the effort involved in human translation. The good news is that it is just delayed for next 3-4 months and on a side note most of the localization work is already put into work from next update. So that it is easy and quick to localize when the right time comes. Also, I would like to apologize to many who were promised localization for next update. And in the end, I’m very very excited about the next release. Happy New Year. It’s been a while since NextGen Reader received last update (more than a month), which is why I’m so excited about today’s 2.2 release. It’s an update with lots of improvements, features and bug fixes. Faster sync: Yes, a great optimization in sync times as compared to version 2.1 with gains varying from 20% to even 60%. Another thing to note here is that changes are immediately synced to Google Reader in v2.2. Huge bandwidth savings: Uses data compression to download articles, therefore reducing size up to 6-10x times. Google Reader service does not supports like and share in reader feature anymore. Option to sort articles by oldest first. Mark above as read: Tap and hold on 51st item to mark above 50 items as read. Haptic feedback: Vibrate when download completes and star icon is tapped. Display folder name when inside a category instead of "All Items". Lock orientation option now works in mobilizer page as well. Fixed bug: live tile doesn’t display ‘999’ if you’ve more than 1000 unread items. There are many more updates and enhancements coming to NextGen Reader. 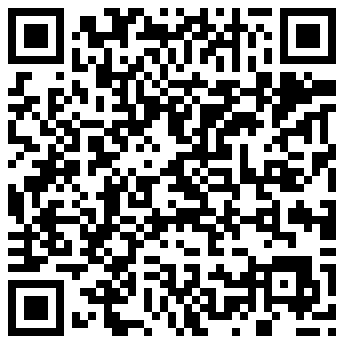 Plus don’t forget to check out our new home page http://www.ngreader.com & get the update here bit.ly/ngreader.